During various training programmes, I often play a game which involves asking participants to write down the first word that comes to mind when I say a certain word. This is the beginning of an exercise in creativity and the purpose is to show individuals how differently we link words with perceptions. For example, if I say ‘set’, some people may write down ‘tea’, others choose ‘tennis’ while ‘maths’ is often given as a response, too. In this first step of the game, another word I sometimes use is ‘model’ and here again, examples of the first set of responses from different participants could be ‘car’, ‘ramp’ or ‘coaching’. Let me clarify: you could be thinking of the ‘model’ of car you wished to buy, the ‘model’ showing clothing on the catwalk or for those of us who are integral coaches we might instantly link to the ‘models’ we almost unconsciously use in assessing our clients. So we need to stretch our minds and see how differently others are seeing the world. And the words we use can often be a clue to this. And of course we express ourselves in so many other ways, too. To many of us, colour plays an important part. So when I see an excellent example of an advert using words, colours and ways of appealing to different senses through different sets of words, I find this very exciting. Below is an example of a poster which I find particularly appealing. But going one step further, I had an ‘aha moment’ when I walked into our neurologist, Dr Zaheer Sacoor’s newly decorated rooms and found that his wife and their decorator had incorporated this magnificent concept into a mural covering a whole wall in their waiting room. This is visually appealing and so appropriate with the work he does. Well done, Dr Sacoor, you are not only a brilliant doctor, but you are thinking outside the box and ‘modelling’ the work you do. Thank you for being such a wonderful inspiration. As integral coaches, we use different models in assessing our clients in order to get a clearer picture of how they are seeing the world and how their ‘issue’ is impacting on their ‘way of being’. 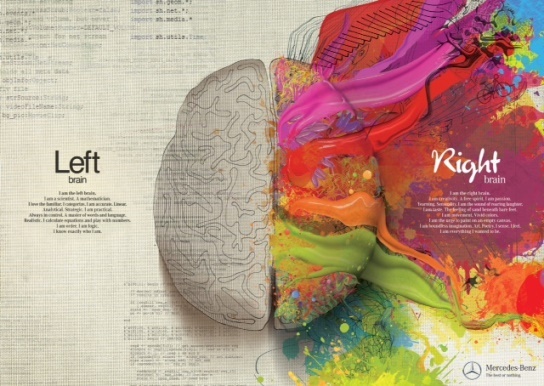 And while the concepts embedded in ‘left brain/right brain’ are woven through other models, I have used the beautiful image above as a screen saver to remind myself to question my clients around these concepts. This just could be my ‘missing model’! For more information on Executive Coaching or training in communication skills please contact brenda@strategy-leadership.com or phone +27 82 4993311. 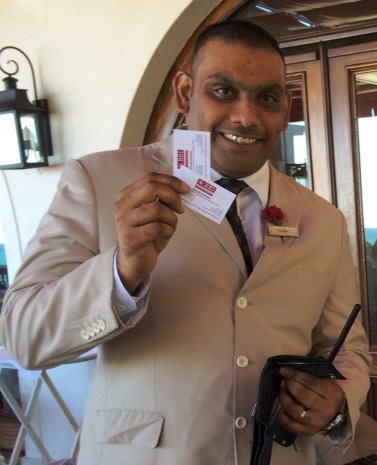 During a recent stay at the Oyster Box Hotel I met a fellow trainer and coach from the UK. I was delighted to be invited to observe one of his excellent training sessions during which he asked participants the question: ‘What is more important, attitude or behaviour?’ This generated healthy discussion. Pondering their responses, I thought of the work of Dr John Adair who in one of his books entitled, ‘Action Centred Leadership’ draws attention to the fact that a person can have all the characteristics of a good leader, but if that person doesn’t put them into action (behaviour) they remain dormant characteristics. The question of the importance of attitude and/or behaviour linked to my experiences as a presenter of interactive workshops. During the sessions, wherever possible, I get participants to practise using their own examples from their work, home and community lives. And as the day progresses, they become more and more proficient. However, no matter how enthusiastic participants might appear during the session and how much they show the right attitude, I receive little feedback, especially after short courses. I want to know how they have applied the new techniques and other learnings during the days, weeks and months following the workshop. He is also constantly applying the formulae in his private life. An example is where he used the PREP and assertiveness formulae to structure a personal letter and this helped him to crystallise his feelings and resolve an issue amicably. Well done, Bradley! So he has applied the learnings and made them part of his way of functioning. It becomes so easy when you know how! Yes, it is important to have the right attitude. In the case of training sessions, people might be eager (attitude) to improve the way they do things (behaviour). And they might participate effectively on the day (attitude and behaviour). However, the way the person actively and consistently applies and practises afterwards will determine ongoing success. New neural pathways need to be built. Let’s move away from the training perspective and look at the question of ‘attitude or behaviour’ from an integral coaching approach. Attitude shows a ‘way of being’ and in coaching terms this links to ‘heart’. Behaviour links to ‘action’. So a missing component is ‘head’. The next question is how do we bring ‘head’ into the equation? By helping our clients to ‘self-observe’ they become aware of what they are or aren’t doing, feeling and experiencing. They might notice their ‘blind spots’. By practising the right behaviours over and over we build new neural pathways. Through an Integral or Executive Coaching approach clients can thus more easily ‘self-correct’ and ‘self-generate’ and thus shift their ‘way of being’. Going back to the original question regarding ‘attitude or behaviour’ being more important, while I believe that a combination of attitude and behaviour is important, there are many other aspects in achieving sustainable success. What is your opinion? For more information on training in communication skills, leadership development or executive coaching, please contact brenda@strategy-leadership.com or phone +27 82 4993311. A proverb can be described as a short, well-known pithy saying, stating a general truth or piece of advice about how people should live that principle. It expresses a belief that is generally thought to be true. An English example would be ‘too many cooks spoil the broth’. There is often a cultural richness in the origins of these sayings. I was delighted when the Tyler Liebenberg, assistant general manager of the Oyster Box Hotel gave me the delightful book, ‘Wisdom from Africa: a collection of proverbs’. 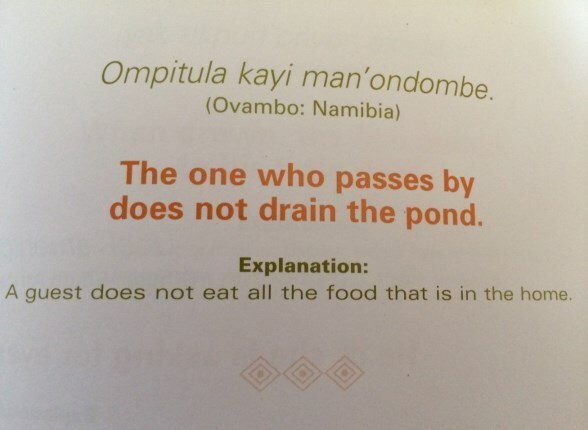 I like the way the compiler, Dianne Stewart provides each proverb in the relevant African language, states the proverb in English and then gives an intriguing explanation. To put this in context, he and his wife have recently bought their first house in Sydney, Australia. At home here in South Africa, we love our avo (avocado pear) tree and relish the fruits that it bears profusely. So I was amused as I read his message and looked at the photo. 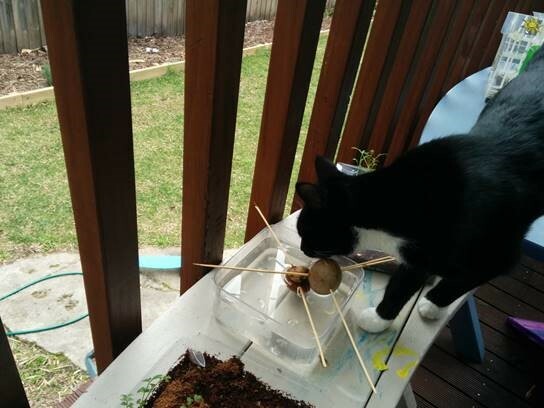 There are more ways to grow an avo than just from the cats’ drinking water. Perhaps I can’t yet call this a ‘proverb’ because going back to the first paragraph of this article, my saying may not ‘expresses a belief that is generally thought to be true’. If I get enough readers telling me they believe it is true, possibly I could call it a ‘proverb’? So, please let me know what you think. This is such fun! Have you ever tried making up your own proverbs? Try it! 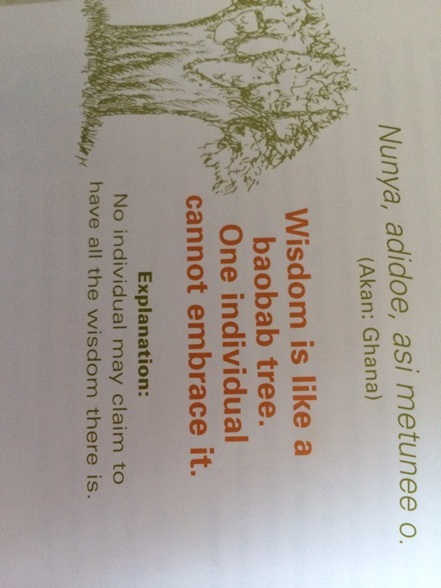 A proverb a day keeps the mind at play. The purpose of the twelve-week Communication Skills course, as implied, is to help professionals communicate better. Young engineers need these skills when effectively reporting upwards to supervisors or instructing apprentices. It also impacts on their functioning within a team. Discussing codes of professionalism are also important, as is the development of each participant’s personal three-year strategy. However, there are many intangible benefits, too. Participants learn the importance of support and networking. And unexpected benefits include the way in which individuals’ learn to tap into their strengths. Sometimes, in coaching terms, it is a matter of moving from ‘head’ to ‘heart’. 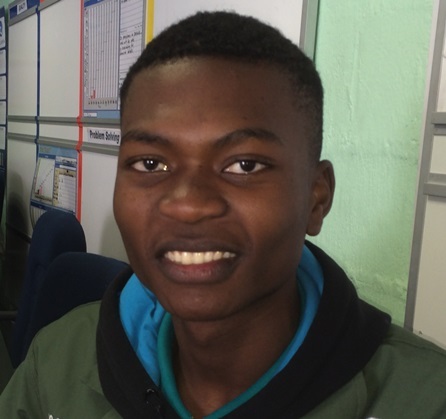 An example was that of Frank Mohlala who when they were all assigned the structuring of a speech on ‘What makes me tick’ wrote a poem. He excitedly told us how this was the first poem he had ever written. Thank you, Frank for sharing your wonderful poem with us. May you continue expressing your thoughts creatively. Leaders fought, people were shot, it was getting late. Children were left in broken homes, in tears and despair. After the conviction and prosecution of our leaders, there was confusion and distraction within the masses; it was time to put the action in motion, for the demolition of the apartheid congregation… all for the future generation. For more information on our Communication Skills courses, other training or Executive Coaching programmes please contact brenda@strategy-leadership.com or phone +27 82 4993311.